Multi-surface roller set, yellow 20550060 https://www.kaercher.com/ie/accessory/multi-surface-roller-set-yellow-20550060.html Two-piece microfiber roller set for the FC5 Hard Floor Cleaner in yellow. These are suitable for use on all hard floors around your home. 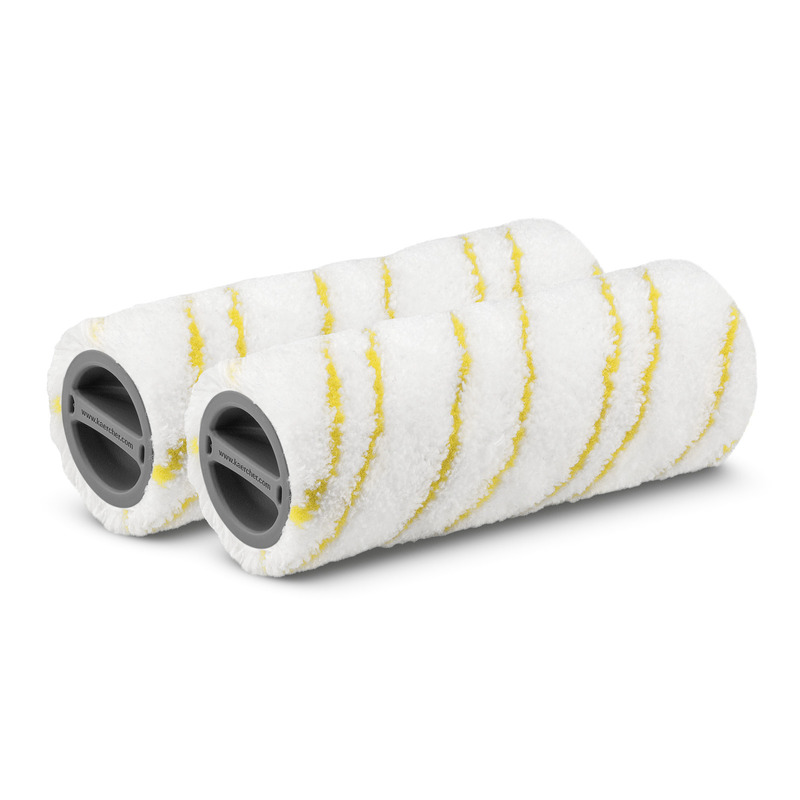 Two-piece microfiber roller set for the FC5 Hard Floor Cleaner in yellow. These are suitable for use on all hard floors around your home. The two-piece microfibre roller set for the Kärcher hard floor cleaner enables the gentle cleaning and care of all hard floors – including laminate. The rollers are lint-free, powerfully absorbent and extremely durable. Thanks to the different colours, they can be clearly distinguished and used for different tasks, for example, one set of rollers in the bathroom and the other in the kitchen. In addition, the rollers are machine washable up to 60°C. Hygienic, for use in different areas of your home (baths, kitchens, fittings, etc.). Multi-surface roller set, yellow is rated 4.8 out of 5 by 16. Rated 5 out of 5 by Kaz1 from Great machine I brought the roller set and multi surface cleaner. This was for the floor cleaner I brought a few months ago. This machine is great lovely clean shiny floors. Rated 5 out of 5 by cole53 from Great features Rollers that came with device are still working awesome I purchase new rollers as back up. Rated 5 out of 5 by Val77 from Replacement rollers Bought these as a spare set for my hard floor cleaner, not needed to use them yet but look as good as the ones that came with the machine and they are great quality. Just wish they did a roller that was a bit more of a scrubber type rather than just micro fiber that could be used if you need to get old floors clean . But the quality of the micro fiber ones is great and do what they say on the tin . Rated 5 out of 5 by Kaneisking19 from Best gadget ever I bought these rollers as a spare set for my fc5 as I didn't know if they would really wash in the washing machine so wanted a spare set to fall back on. However I haven't used them yet as they wash up great in the machine. Rated 4 out of 5 by andynjulie from Fabulous floors Rollers work great and our floors have never looked better. Used Bona cleaner and took my time as the floors had not been washed in some time. My wife is really impressed with their appearance and condition. Rated 4 out of 5 by The Dog Lady from Cleans and vacuums well I have a number of dogs and a very big kitchen. Every day I vacuum then mop the floor. This picks up the hair and small debris. The rollers are gentle but abrasive enough to scrub the porcelain tiles better than I could do with the mop. It’s quicker for me to use my cordless vacuum plus the mop I admit but I will use this a couple of times s week to get the floor extra clean. I bought an extra set of rollers as I wanted to be able to have clean rollers on hand without the need to wait until the other set were washed. I didn’t find it at all heavy. The only criticism I have is the dirty water tank is a bit fiddly to empty without making a mess and for the price it should include an extra set of rollers as they are in my opinion a necessity and are costly.